Sold as a single block classified Deodorized Grade AA pure prime pressed from Ethical Trade Cacao. Cacao Butter, pure with no added fillers like shea butter, milk, casein or sugar. Santa Barbara Chocolate offers a pure and natural product that is tested for safety and consistency. Vegan Cacao Butter is used in manufacturing of chocolates, edibles and baked goods. It is the industry standard for manufacturing premium quality pharmaceuticals and cosmetics. GMO Free Block in a 55lb case. It is filtered for safety, untempered, raw and fresh pressed. It is shipped in a FDA approved bulk package box. Considered a chocolate factory industrialized ingredient, it is an edible cocoa butter suitable for pharmaceutical grade applications. We audit all processes and only press fresh cacao for the highest quality and top cleanliness standards. We do not use unwashed raw cacao for pressing. This is why if you want safe, high quality and best tasting cacao butter we are the smart choice. Is Cacao Butter and Cocoa Butter the same thing? Yes, it is the same single ingredient and the terms are synonyms. Cacao Butter as a definition is more popularly used in Latin America while Cocoa Butter is the standard of identity used in the USA. Cocoa fat and Cocoa oil are common names also. The process of making the ingredient can vary as can the resulting raw material after pressing. 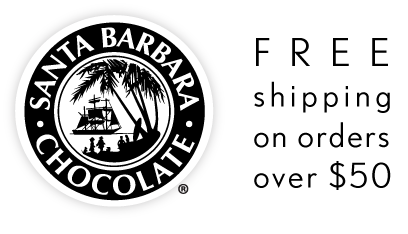 Santa Barbara Chocolate tests for heavy metals and harmful chemicals for food safety. You will notice the difference in tasting and manufacturing quality. Pure cocoa butter is made from the natural fat pressed from cocoa beans. It is 100% cocoa solids, vegan, natural and a great tasting edible ingredient you can use in chocolate making and cooking. Vegan Cacao butter is one of the most versatile of all chocolate ingredients. To make cocoa butter white chocolate truffles (you can try variations and use vegan milk options like Almond or Hemp). Melt all ingredients together over low heat and stir until smooth, pour into a bowl and give it a few hours to set up. Scoop into balls and roll in nuts = white chocolate truffles. *Sweetened condensed milk is most shelf stable but you can also use cream or vegan milk for low sugar healthy versions or combinations thereof (boil cream first before mixing for sanitation reasons and to reduce the water content). *Cacao butter can be used in place of coconut oil or butter in all recipes. It is more healthy than dairy butter because of the cocoa antioxidants. It is a better choice for skin care because your skin will absorb the cacao antioxidants topically. Try adding to coffee (more enjoyable than ghee coffee because it thickens without too much flavor). Cacao Butter sold in bulk. This is pure cocoa butter with no added fillers like shea butter or casein.